As of September 6th, 2013 our Home page became an active blog ... for the purpose of presenting topics that do not fit in the Tab descriptions above, announcing new entries under the static tabs and for updates on what the advocates of the Galion Garden Group are thinking about and accomplishing. One other change - the emphasis color of blue that confused what was a link and what was ordinary blog text has been changed to green. On April 3rd, 2013 we published the following... NO CHANGES have been made although we have dropped some ideas and expanded others. This site is not intended to be an ordinary BlogSpot. There won’t be daily submissions about the proven benefits of Aquaponics. The pages are static, meaning that a collection of categorized Aquaponic subjects in identified/linked videos, articles and websites, found to have value for someone looking for Aquaponic information has been pre-assembled by one of the founders of Galion Garden Group; Rick Hickman, aka - GGG Admin. Hopefully, those of you that visit here will find something of interest and value to you. 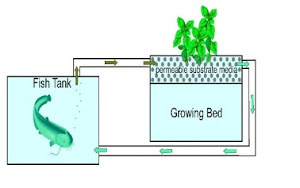 Kudamino provided this illustration of the simplicity of Aquaponics. Is the information here complete? No. Is GGG Admin an expert? No. Are we willing to share what we have learned thus far researching and putting the Aquaponic system(s) into practice? Yes. Is Aquaponic gardening organic and green? Yes. Is Aquaponics a fad? Definitely not! Aquaponics is the individual, urban and commercial wave of the future. If so, the following pages were developed for you. Fortunately, many of the pioneers and practitioners of Aquaponic gardening have generously shared their experiences; triumphs and failures, on Internet websites and in particular on YouTube. The information available to review is at our fingertips. The videos provide an easy visual learning experience and can be watched repeatedly. One practitioner’s system may not be ideal for you; often if you are considering a grow bed set-up, something a rail/tube or vertical gardener has done will give you that “Aha” moment that provides just the answer/concept you were looking for. This site will deal primarily with a Do-It-Yourself interest and practice, however, there is a great deal to learn from the sites that are selling products and systems; you may even chose to go that route. GGG is not selling or endorsing any products or services. Futuristic considerations include forming a group of enthusiasts to create a Community Supported Agriculture (CSA) assosciation. Starting an Aquaponics system is relatively inexpensive, depending on how much effort you want to put into it. Scrounging around for reusable and recyclable items and containers will help you to start inexpensively. The purpose of galion-garden-group.blogspot is to act as a resource for those individuals/groups/clubs/organizations/institutions in the Galion community and elsewhere to be introduced to the year-round sustainable urban gardening practices/accomplishments of previous practitioners and pioneers using an Aquaponic or similar system inside their home, apartment, or residency, in the kitchen, dining room, spare room, closet or basement, in their garage, in a barn, carport or shed, on their deck, on their patio, on their balcony, in their backyard, on a wall, on a fence, in their window, on a roof, in a vacant lot, in an empty building, or in a hoop house or greenhouse. There are also Aquaponic systems in schools, universities, churches, and businesses; even someone else’s property (with permission of course). Tates Creek High School in Lexington, KY is one example. See the presentation Sustainability in Action – Aquaculture. The larger successful Community Supported Agriculture (CSA) Aquaponic operations in Cleveland, Milwaukee, Denver and many others throughout the world are continuously testing new theories and methods and their past conclusions are, and their future results will be of value to each of us. This young lady introduces Growing Power, Inc., Milwaukee, WI. Several residents of Galion, in casual gardening conversation, in December, 2012 and January 2013, decided to form a loose-knit group; the Galion Garden Group. This blog is one result. Test indoor grow beds and a rail/tube system are being constructed. Pertinent information is being gathered and recorded. Contacts with other Aquaponic novices and experts are being established. Plans for a public meeting in the near future are underway. Chris Gimbel and Kellie Hamilton, of KC's AquaWorld, are avid gardeners and are setting-up several prototypes of Aquaponic systems and are available to share what they are learning as they use Aquaponics to grow fodder for their livestock. Chris has several outdoor garden plots were he pursues his interest in growing peppers. Kelly shares his interest and designs her own hanging baskets of flowers for decore around their home, on their balcony and as colorful living gifts. Rick is the administrator of the Galion Garden Group blog. Prior to moving to Galion, he was a member of a successful Square Foot Gardening club in a senior community in Mt. Gilead. There he built and maintained table-top, container and in-ground garden plots with some of his neighbors. To share and develop Aquaponic experience, education and resources with the residents of Galion. To promote individual, family, and community supported self-reliant, sustainable organic and green your-round fresh food production in phases. Phase I Educate and recruit individuals and groups. Phase II Encourage the initial volunteers to become activists. Phase III Help those activists establish a not-for-profit Community Supported Agriculture (CSA) organization. You are invited to join us as an Advocate. Who becomes a GGG Advocate? An individual/family/group that decides to give Aquaponics a trial-run. An individual or group who spreads the word about this amazing method of gardening, at their school, church, club, employment or to anyone that will listen. A charitable individual/group who underwrites the start-up cost of an educational system for a school, club, food bank, or other community service organization that can benefit from the harvest and expansion of an Aquaponics system. The pioneers above maintain contact, share their mutual efforts, successes and failures with each other and plan to enlist the support and endorsement of local officials, businesses and organizations to create a CSA here in Galion. Phase IIIThe establishment of a Galion CSA, will require the help of many. Leaders must rise up from the activists. The city could donate access and use of downtown abandoned property. Materials to build a large system need to be found through donations and grants. Contact Chris or Kellie at KC’s AquaWorld. 11 a.m. – 6 p.m. by stopping by the store at 110 Harding Way East. ... or ...use the contact tab at the top. This BlogSpot, Our Food Sources and Resources Today, Overview, the Future is Now, and Excellent Websites. after GGG Admin read two books. Will Allen's chronicle of his journey in the book Good Food Revolution and his accomplishment in developing a Community Supported Agriculture (CSA), not-for-profit organization that transformed a food desert in Milwaukee, WI. In researching Growing Power, Inc., on YouTube, many more Aquaponic pioneers and commercial endeavors were found sharing their experiences and knowledge there. One was Sylvia Bernstein and a promo for her book, Aquaponic Gardening, a step-by-step guide for the Aquaponics beginner to start small and grow their own system with her experience and suggestions to guide them. Her websites; one of which is an Aquaponic Community and Forum where aquaponic enthusiasts meet and share information is contributing to the growth of interest in Aquaponics. The Aquaponic Source is a company in Boulder, CO, run by Sylvia and Alan Bernstein, which was established to serve the aquaponic gardening community in North America. They also sell the AquaBundance Kits. Recently while creating Galion Garden Group's BlogSpot, GGG Admin found Rebecca Self, of Food Chain Lex., an inspiration. On YouTube, even more individuals have posted Aquaponic how-to's and do-it-yourself videos. GGG Admin has published some of them here to publicize the opportunities for quality food sources Aquaponic gardening offers to residents of Galion as individuals or groups or the community at large. This blog is GGG Admin's contribution --- the doing is up to you. Birke Baehr, an 11year old tells it like it is. * 5:22 mins. Not to bemoan or belabor the quality & origin of our food sources the following four reports are worthy of a serious perusal. The first one leads to the thought that perhaps we should grow our own food. The second predicts a dire future unless we change the way we farm as individuals and as urban communities. Aquaponic gardening appears to be a system that addresses both quality and ecological issues. "Teach Every Child About Food" is a call-to-action. The tab Self-Reliance/Sustainability addresses these concerns in depth. Real Food Evangelist * Robyn O'Brien * 18:27 mins. This mother of four was shaken awake by the dangerous allergic reaction of one of her children to a "typical" breakfast. Her mission to unearth the cause revealed more about the food industry than she could stomach, and impelled her to share her findings with others. Informative and inspiring. The Other Inconvenient Truth * Jonathan Foley * 17:43 mins. We typically think of climate change as the biggest environmental issue we face today, but maybe it's not. In this presentation, Jonathan Foley shows how agriculture and land use are maybe a bigger culprit in the global environment, and could grow even larger as we look to feed over 9 billion people in the future. Teach Every Child About Food * 21:54 mins. ...the new GMO Arctic® Apple will be drenched in toxic pesticide residues, untested by the U.S. Food & Drug Association (FDA) and likely unlabeled. And of course these shiny new high-tech apples will be cheap, priced considerably lower than a pesticide-free, nutrient-dense, old-fashioned organic apple that turns a little brown after you slice it up. Many of the pioneers and practitioners of aquaponic gardening have generously shared their experiences; triumphs and failures, on Internet websites and in particular on YouTube. The information available to review is at our fingertips. The videos provide an easy visual learning experience and can be watched repeatedly. The following categorized videos, articles and website addresses are meant to stimulate your imagination. Hopefully, you will find an ‘Aha!’ moment and convince yourself that you too, can do a modification of something you see or read here. Some of the information is NOT pure Aquaponics but is offered because it could be converted/incorporated into an Aquaponics system. You may choose to follow a particular aquaponic gardener step-by-step or take an idea from one and add it to another’s practice for your own project. There is a great deal to be learned and understood from the commercial, larger operations and the ready-made kit providers as well. Good Luck! Many of these systems would be appropriate Indoors or Outdoors. Think wheels on your units. Aquaponics is Easy! * easydiyaquaponics * 2:21 mins. This is a promotional video for Easy DIY Aquaponics. Build your own backyard aquaponics system and save money by growing your own fruits and vegetables and by raising fish. With Aquaponics technology you can grow up to 10 times more food in 1/5 the space in half the time all year round compared to a conventional garden. See: Weeks 1, 2, 3.5 and 5 too! Garden Rhythms - Aquaponics * Paul Holowko * 29:23 mins. This show describes how to establish a "no feed fish" aquaponics system. For more information on the subject, visit Paul's Website. Affnan's Aquaponics - Help Us Go Green * 3:14 mins. Malaysian Affnan Ramli is an example of the generosity of the pioneers of Aquaponics. Affnan is a true innovator. A GREAT guy who's remodeled Bell Siphon has become the industry standard. The music is so appropriate. His website has loads of information. Small Scale Aquaponics * 5:44 mins. Ann Forsthoefel of "Aqua Annie" is excited by aquaponics, the growing of plants fed by nutrients from fish, which in turn provide a source of food when they reach maturity. "There are so few inputs compared to growing crops in the soil," she said. Don't miss this video! It is an in-depth description of basic Aquaponics plus, plus, plus, plus! Aquaponics - Getting More Out of Less * Charlie Price * 21:02 mins. Charlie Price from the social enterprise Aquaponics UK, explores the role aquaponics can play in the future of our collective food supply. He provides an insight into both the applications for aquaponics but more specifically a new approach to urban agriculture, turning wastes into resources and transforming disused urban spaces to provide not only food, but resilient communities. See: the topics Permaculture & Food Forests under the Self-Reliance/Sustainability tab for more proven long-term solutions. Aquaponics * Purdue University * 15:17 mins. An informational video about Aquaponics, the practice of combining fish farming and hydroponics. The program is an introduction to the recommended practices and guidelines for starting a successful commercial Aquaponics operation . The video was supported by Purdue Extension, NOAA, & Sea Grant Illinois-Indiana. Aquaponics - the Future is Now! Viraj Puri: Innovations in Urban Agriculture * TEDTalks * 10:17 mins. A farm in the middle of New York City. Sounds absurd? Not for Viraj Puri. With his company "Gotham Greens" he reduces transport distances to a minimum - and accelerates a shift in thinking. Note: Gotham Greens is building a greenhouse on a Whole Foods rooftop too! Aquaponics Association Farm Tour * web4deb * 2:55 mins. This is an overview of the three aquaponic farms that had open houses during the Aquaponics Association conference in the fall of 2012. See: web4deb's many videos on YouTube. Also See: Aquaponics Association, Turnkey Aquaponics, and Colorado Aquaponics. Sahib's Zero Lot Urban Hybrid Aquaponics System * 3:41 mins. Sahib demonstrates multiple Aquaponic set-ups that gives you the endless possibilities to grow your own food locally and naturally without the use of harmful pesticides and chemical fertilizers. These urban hybrid Aquaponic growing systems can be scaled to size and can be replicated. HOME TOWN FARMS® A professional pitch for urban gardening. Vertical Organic Urban Farming [in community buildings] * 3:57 mins. Home Town Farms combines proven vertical farming (growing) technologies in such a way that drastically reduces the amount of water, fuel, fertilizer, packaging and land that traditional farms use to grow the same amount of food. Home Town Farms will virtually eliminate the cost of transporting produce hundreds if not thousands of miles by setting up vertical farms in densely populated areas with direct to consumer sales, on location where the food is grown in addition to wholesale sales to local farmers markets, restaurants and grocery stores. Urban Farming that is economically viable today! Topics include; A new way to farm, Why aquaponics?, What can I grow?, How do fish help?, and more.